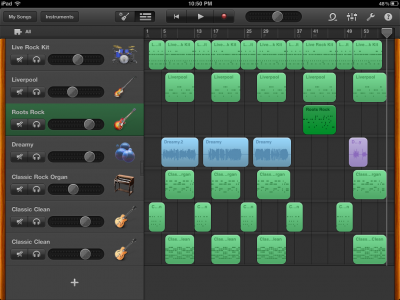 Like I wasn’t gonna get the new GarageBand for iPad?? It’s pretty good but VERY frustrating. There are tons of bugs and it’s a little too slow to keep up with any kind of complex strumming. I lost my whole guitar track once and, by the end of the session, the sequencer view thingie was about a bar and a half out of step with the sound. You can see from the screenshot that the bars don’t really line up with anything. I wanted to fix up some stuff but I decided I should quit while I was ahead. Here’s my first attempt at making music. I can’t figure out how to create a fade. Anyone? I’ve been practicing Ride a White Swan on guitar and meaning to record it for a while. It’s a simple song but the chord change is pretty tricky. It’s easier to play when you just have to tap the iPad but it doesn’t sound as good as the real thing. 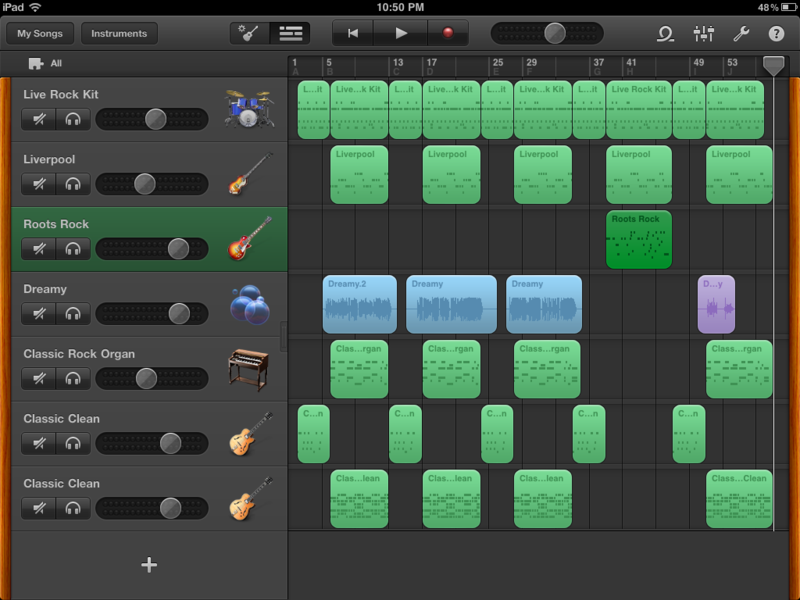 I’ll need to record it on GarageBand proper for comparison. For the drums and bass, I used the auto-play thingie. TIP: if you use any drum set except the rock kit, it’ll mess you up and you’ll never be able to keep time with it. Keep it simple. Same with the bass. I started with a fancy bass riff but it sounded silly and overwhelmed everything else. There are three guitar tracks. For the riff, I used the auto-chord selector and then just picked out notes from the chords. For the rhythm guitar, I just banged on the chord name like a chimpanzee. I tried picking out an arpeggio on individual strings but my poor iPad was too slow to keep up. I played the lead part on the single note setting. This is really well done. You can do slides and hammer-ons and hammer-offs and really nice bends. I couldn’t figure out how to get further up the neck so if your solo has any high notes, I guess you are screwed. Birthday’s coming up so maybe I’ll get the plug-your-guitar-into-your-ipad connector but there is plenty of fun to be had with the so-called smart guitar. I recorded the vocals with the dreamy effect. 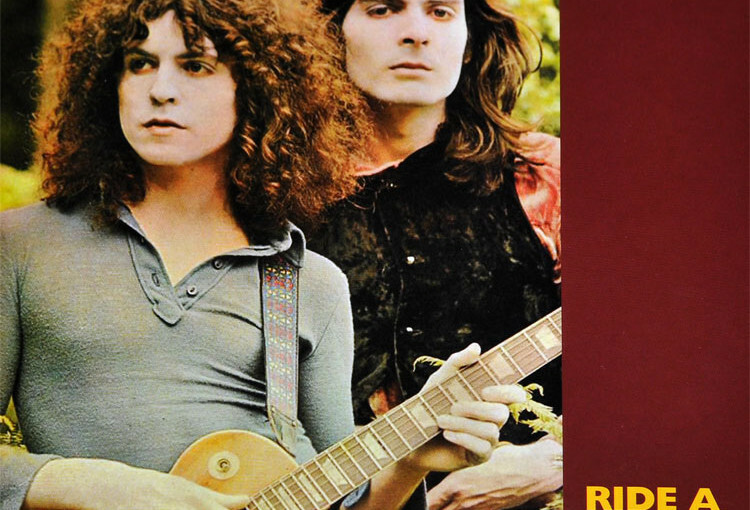 Sounds just like Marc Bolan, don’t you think? That’s probably my bronchitis. I added the keyboards because it seemed a shame not to. If you get a chance I think you should try out Garageband on an iPad2 — maybe at the Apple Store — and see if it can keep up where your iPad fell behind. And then what? Be miserable that I don’t have an ipad2? But I’m pretty impressed with what you were able to do in spite of the limitations! I’ll definitely be picking it up after I update to the latest iOS. As luck would have it, my friend had her iPad2 delivered to my house while she is on vacation. It just arrived. Maybe she wouldn’t notice if I switched them? I could paint a little camera on the front. BTW It took me about an hour to create the first version of this track; 3 or 4 hours of faffing to try to fix the problems and then about 30 mins to throw it all away and start over. Oh well, i’ll try later through some other apps. Hey, not bad at all. How cool is that? Do you have a real guitar recording for comparison too? I’ll try recording it on my guitar this weekend. Previous Previous post: It’s a Miracle!